New in this version: additional HAM6 conversion improvements, better dynamichires quality thanks to improved checks dithering. New in this version: higher quality HAM6 conversion due to improved triple mode and LAB mode combination. Experimental HAM5 conversion. 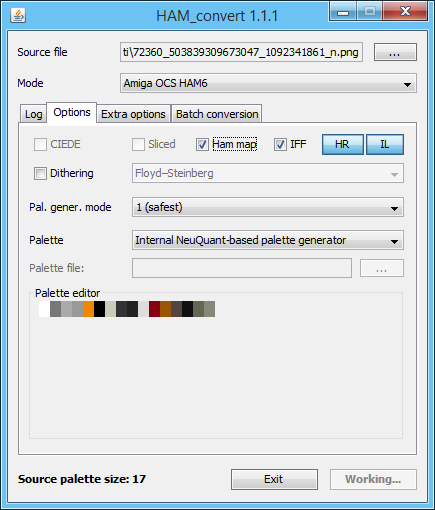 New in this version: alternative CIELAB-based HAM6 conversion mode, more advanced DynamicHires/PCHG conversion, checks dithering in non-HAM modes, support for saving PCHG IFF files. New in this update: improved and optimized triple mode and added line checks dithering designed to look better in HAM6 than standard dithering methods. A new version extending the existing dual mode and adding the experimental triple mode. A new release with HAM6 and DynamicHires improvements and bug fixes. A new version featuring cli mode and lots of tweaks and bug fixes. 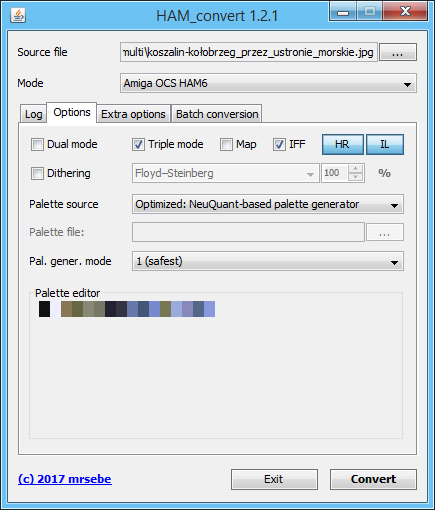 A new version featuring batch conversion, multithreaded HAM6 palette optimization and DynamicHires improvements.